This blog was originally published on MSDynamicsWorld. More often than not, businesses perceive ERP and e-commerce integration as an IT and Operations project. But nothing could be further from the truth. While integration usually begins as an exercise to address the IT and operational challenges of data transfers between two systems, integration has far reaching benefits that should not be underestimated. To help integration advocates drive this point to the stakeholders in their organization to get their buy-in, we will examine how ERP and e-commerce integration can have an organization-wide impact on a business. Read on to understand how ERP and e-commerce integration impacts various departments in the entire value chain. The ability of a business to reach out and serve to a wider audience successfully, either by increasing market share or by expanding to new geographies, rests on a business’s ability to scale (infrastructure, marketing, resources, budget, etc.). Often, businesses fail in their efforts to scale and expand because of the time and effort involved in the exercise. The same is true for businesses selling online. With e-commerce (where you take orders) and ERP (where the orders are fulfilled) systems working in isolation, the growth of a business is limited by the number of orders they can manually transfer from e-commerce to ERP system. If they have to scale and accept more orders, they have to then add more resources to transfer information between the two systems (a process which is both cost intensive and prone to errors). Integration can help businesses break this barrier by automating the information flow between the two systems. Once the integration is in place, businesses can add more customers, expand to various geographies, etc. without worrying about order fulfillment. ERP and e-commerce integration can also help businesses leverage the same e-commerce platform to even serve their B2B customers. Businesses today sell across multiple channels and have customers both who shop across channels and customers who prefer a specific channel. To target them better, businesses have to ensure that they have a 360-degree view of their customers. This requires measuring customer interaction across all touch points, which is not feasible with information residing across multiple disconnected systems. 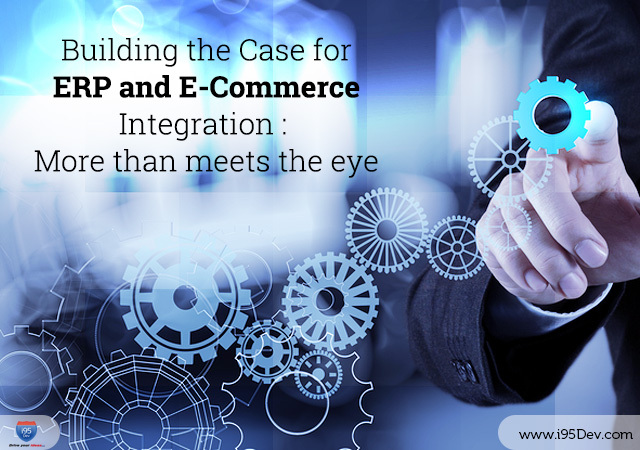 The ERP and e-commerce integration helps you overcome this by centralizing customer information and all interactions across the two systems. Armed with this information, the marketing team can now run marketing campaigns that are both targeted and multi-channel. While multiple channels might be manageable in a disconnected environment at a small scale, an integrated environment amplifies the impact by driving a unified and consistent message across channels while centralizing the operational effort. Integration of ERP and e-commerce also helps in driving operational efficiency and resource productivity by eliminating manual processes and automating business workflows. Orders can automatically flow from the e-commerce system to the ERP system where the order fulfillment process can be further automated in areas like packaging, generating shipping labels, updating the customer of the order and shipment status, and more. The automation not only reduces costs and errors (by eliminating manual processes) but also enables your resources to re-prioritize and re-focus, thus improving their productivity. Integration also makes it possible to manage all the critical information like products, customers, inventory, etc. in one system further reducing the operational overheads. Customers today are central to all businesses’ efforts and decisions. Everything related to ERP and e-commerce integration also contributes towards improving the customer experience – inventory sync improves customer experience by preventing avoidable situations such as overselling of products, customer and order sync enables informed sales, and product information sync enables improved experience across channels. Moreover, with ERP integration the e-commerce store doubles as the customer’s self-service portal; which also allows your resources to reduce low-value activities like answering phone calls and doing data entry and re-focus on high-value activities like improving customer lifetime value. One of the greatest challenges decision-makers traditionally face is the availability of accurate and actionable information. Critical business decisions are often made based on ‘gut feelings’ that are shaped by outdated and inaccurate data. For a business lacking integration between critical systems like ERP and e-commerce, it is not difficult to imagine why such problems might arise. Managing Payouts of Sales Commissions and more. Bottom line, it is imperative for all functions within the business to work together like a well-oiled machine to accomplish customer satisfaction. An integration helps by eliminating routine tasks and centralizing information, thereby enabling all functions of the business to focus on a common goal – customer experience. For more benefits of ERP and e-commerce integration, read our e-book 18 Crucial Reasons You Should Integrate ERP & eCommerce.